The direction of Tideflex Engineering is to develop systems that are simple in operation and require little or no maintenance while at the same time achieve the highest levels of performance. The Tideflex check valve and mixing nozzle provides the simplicity and maintenance free operation required. The Tideflex Technology Engineering Department has developed several specialized design models specific to the performance characteristics of the Tideflex Check Valves and Hydrodynamic Mixing Nozzles. Tideflex also integrates specialized models available in the environmental industry such as Computational Fluid Dynamics (CFD) for hydrodynamic mixing design within fixed boundaries. Tideflex Technologies utilizes and maintains the most current version of the design software AutoCAD and provides consulting engineers CAD files of the proposed and final mixing systems. The combination of specialty constructed products and hi-tech computer modeling has made the Tideflex mixing systems product lines the most innovative in the industry. Tideflex Technologies approach to mixing design and the validity confirmed through computer modeling is redefining many of the standards and guidelines applied to mixing design. The Tideflex Aeration Model is set-up and run by Tideflex design engineers specific to the application, key design factors and results are identified and highlighted in the model output. The model output is printed in Adobe full color format and emailed directly to the consulting engineer for review. Once the design has been finalized between Tideflex engineers and the project consultant the output model becomes a process operations document and is included within the Installation, Operations & Maintenance Manual provided by Tideflex with the system. The Tideflex TMS Hydraulics and Mixing Analysis Model is set-up and run by Tideflex design engineers specific to the application, key design factors and results are identified and highlighted in the model output. The model output is printed in Adobe full color format and emailed directly to the consulting engineer for review. Once the design has been finalized between Tideflex engineers and the project consultant the output model becomes a process operations document and is included within the Installation, Operations & Maintenance Manual provided by Tideflex with the system. The Tideflex HRMS Model is set-up and run by Tideflex design engineers specific to the application, key design factors and results are identified and highlighted in the model output. 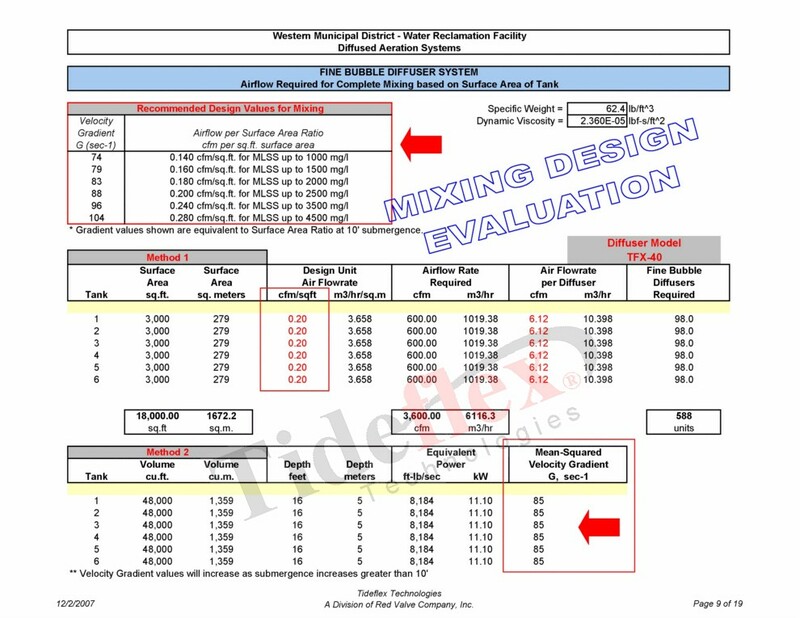 The model output is printed in Adobe full color format and emailed directly to the consulting engineer for review. Once the design has been finalized between Tideflex engineers and the project consultant the output model becomes a process operations document and is included within the Installation, Operations & Maintenance Manual provided by Tideflex with the system. The Tideflex Effluent Diffuser Hydraulics Model is set-up and run by Tideflex design engineers specific to the application, key design factors and results are identified and highlighted in the model output. The model output is printed in Adobe full color format and emailed directly to the consulting engineer for review. Once the design has been finalized between Tideflex engineers and the project consultant the output model becomes a process operations document and is included within the Installation, Operations & Maintenance Manual provided by Tideflex with the system.